The still fresh McCutcheon v FEC Supreme Court decision, which removed limits to political campaign contributions, has angered activists and reformers, who call it nothing less than the privatization of government. But what if neither side is right? Flickr/Stephen Melkisethian. Some rights reserved. The still fresh McCutcheon v FEC Supreme Court decision, like the January 2010 Citizens United, has again set off the rage of activists and reformers—who call it nothing less than the privatization of government or the end of the republic! Indeed, removing aggregate contribution limits does for individual donors what Citizens United did for corporations years earlier, make it easier to influence elections. Yet, the apocalyptic cries, however comprehensible, are largely misdirected anger and misguided strategy. Since Citizens United, there have been fervent movements to “get money out of politics” from Movement to Amend (to overrule the case by Constitutional Amendment) to Lawrence Lessig’s Rootstrikers petition (to enact tough campaign finance laws and promote a government-funded option). The idea, remove large campaign donations and see saner policies and better government follow, seems plausible enough. But let’s parse the obvious. Citizens United did not cause the predominance of money in American politics; it is but a symptom of it. Both election data and opinion polls show no significant differences in outcomes or policies before and after 2010. The reforms overruled in these cases began in 1971, (1907 depending on how one counts) and were revised half a dozen times to make them “tougher,” but they never prevented the reality, or perception, of donor dominance over both Parties and Congress. More importantly, even if the rules gutted by McCutcheon and Citizens United had been effective against the influence of big money in campaigns, they still would not have made elections free or equitable in any meaningful sense. There are many ways beyond campaign contributions that wealth influences government, and elections, as we will see, have bigger troubles altogether. 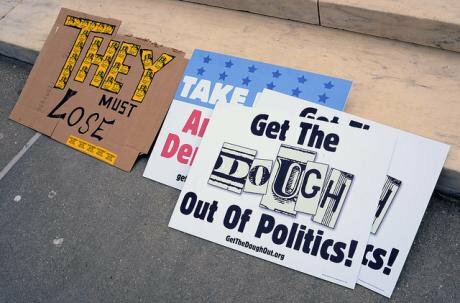 The loud protests, especially on the left, focused only on campaign finance miss the deeper issues and alienate potential allies—yes, libertarians like the Tea Party who would also scorn elites. The protests are wrong-headed because they attempt to empower the people by silencing the wealthy. This is both foolish and undesirable. Written just after the Citizens United decision, Lawrence Lessig’s Republic, Lost: How Money Corrupts Congress--and a Plan to Stop It, advocates a conventional remedy, capping corporate and individual contributions to political campaigns and instituting a publicly-financed option. He believes this would “strike at the root” of corruption, and, by itself bring government for the common good. Lessig makes a poignant observation. Disclosure laws themselves do not curb the influence of wealth, but rather sanction it by making it transparent and legal. In a like manner, lobbying, once considered silly and unseemly, has been professionalized, normalized and made acceptable. Between 1974 and 2008, the average amount needed to run for a House seat climbed from $56,000 to $1,300,000. Behind these growing figures are the economic stakes. Government divvies up more economic rents—“corporate welfare”—than ever before, so businesses stand to gain immensely from investing in candidates, especially those on committees of interest to their industry. But many campaign finance reformers miss the soft ways that money influences politicians—like the lobbyists who do favors for sitting politicians and promise more when they retire,—the problems associated with professional politicians—e.g., the incentive to support short-term policies to win the next election, and most importantly, the structural biases of American elections that severely limit voter choice. The malignant effects of a duopoly go beyond limiting voter choice at elections, or allowing parties to extort donors and voters by pointing to a “worse” alternative. Duopoly reduces every important social or political issue to simplistic alternatives. It then drags the media and the public sphere along. Complex, multifaceted issue are reduced to the pros and cons of one or two options, repeatedly pitched in emotional talking points by well-coached spokespersons of the two parties. Duopoly poisons the collective brain. Campaign finance would do nothing about this. In a previous Truthout article, I mentioned organizations in the United States working to give voters more choice through voting and electoral reform. But even those could not of themselves herald an ideal democracy. No type of elections, no matter how free and clean, no matter how representative and diverse, would create democracy in the sense of government “by and for the people.” This appears not at all understood by mainstream, or even progressive, media and certainly not by “expert” talking heads. Elections always favor one elite or another, whether wealthy, connected, charismatic, or simply tall and handsome. Cash is only one source of privileged access to the political sphere. And, focusing only on elections, however scrubbed and reformed, neglects an important justification of democracy in the first place, tapping the knowledge of the public to lift the entire ship! Elections alone cannot do that. But combined with non-electoral popular controls on governments they could. To his credit Lessig mentions a more thorough—in many ways easier—reform: use citizen “Deliberative Polls” (first coined by James Fishkin) to amend the Constitution to not only reform campaign finance but also to reflect today’s values and realities. The use of such “minipublics,” as Robert Dahl called them, is the kind of reform increasingly talked about by historians of democracy. Non-electoral checks on elite control have always involved counteracting the structural bias of the election mechanism by directly commissioning citizen amateurs in self-government. Such is also the idea behind our jury system itself, perhaps the last remaining Anglo-American institution respected by both left and right. The jury, screened for conflicts of interest, shielded from lobbyists and mobs, leverages both society’s moral conscience and collective wisdom. This article will mention two contemporary political scientists thinking along these lines, the first takes ancient Athens as focus of observation, the second Republican Rome through the eyes of, the original political realist, Niccolo Machiavelli. Stanford classicist and political scientist Josiah Ober, in Athenian Legacies, addresses the question: How did Athens flourish for so long despite differences and inequalities? Despite much wealth inequality and a healthy amount of diversity, no single class or group dominated the others. And it was a very open, democratic society. The answer accordion to Ober was the institution of the Council of 500, a group selected by lottery once a year from among the ten “tribes,” to manage the agenda of the mass citizens assembly (of 5000-6000). The smaller group restrained the influence of wealth and privilege that dominated the assembly and elected offices, and perhaps more importantly, says Ober, created a network of citizen knowledge. The team from each tribe—administrative, artificial tribe form different clans and localities—brought together 50 amateurs from a diversity of backgrounds to serve their country for an entire year. Because they viewed it as both duty and privilege, and knowing they would serve once in their life time, Councilors took their role seriously. Ober’s deep insight is that this non-electoral mechanism not only served the political purpose of letting people feel they governed themselves, but it had an educational (cognitive and cultural) benefit. In both the teams of 50 and 500, knowledge from the different localities (demes) was brought to the center. Likewise, knowledge of how the central government worked and the issues of the day emanated out to the demes. Moreover, the actual experience of serving on the Council, that the vast majority of adult male citizens would be called to do at least once, gave Athenians the best imaginable training in the culture of politics. Also written the year of Citizens United, John P. McCormick’s Machiavellian Democracy makes another non-electoral recommendation for long-lasting reform. Machiavelli studied the practices of Rome during the Republic and made recommendations to this contemporaries in Renaissance Italy to foster long-term stability. He noted that the masses had exclusive access to the Tribunate. The practical effect of this People’s Tribunate was not only to limit elite control of government but to create a stable equilibrium between the Patricians (elites) and Plebeians (commoners). For Machiavelli, it is the Prince and elites who are often ambitious and greedy, while the masses tend just to want to be left in peace. Curbing elite power was key to Rome’s long term stability. A Roman Tribune was a people’s representative with veto power over both Senate legislation and orders from magistrates. Tribunes could also call the Senate or Plebeian Council to order and propose laws before either. Most importantly, a Tribune was sacrosanct. Anyone, regardless of rank, who touched or hindered a Tribune within the city of Rome would face a death sentence from the Plebeian army. This sacrosanctity of Tribunes was not only a general veto power, but was a way for the people to impeach any government magistrate for violating law or duty. McCormick envisions, like Machiavelli, institutionalizing class conflict by making essential parts of government dependent on citizens selected by lot. He would create a modern People’s Tribunate that would exclude economic and political elites. It would have the power to veto one Congressional bill, one executive order, and one Supreme Court decision per year. It could also call one national referendum on any issue it wishes, and with a 3/4 vote impeach any federal official according to the US Constitution. To help right historical exclusion and institutional racism, membership in the People’s Tribunate would give affirmative action to African Americans and Native Americans, thorough a weighted lottery. These bodies not only set their own rules, that have the effect of law, but also hold quasi-judicial hearings to decide particular cases. In effect, they are a government within the government. Any reform that seeks to empower citizens should address this elephant in the room. But democratic reforms like those suggested by Lessig, Ober, or McCormick could be easily adapted to the realities of Executive power. For example, one can imagine People’s Tribunes with veto power on the boards of the FEC, FCC, FDA, and others. These are only the beginning of what’s possible starting from direct citizen empowerment. But particular fixes are beyond the present scope, which is to publicize a fact about would-be reformers and online petitioners. Those who imagine themselves “striking at the root” are merely tapping on the trunk with blunt instruments. At any rate, protestors should stop whining about wealth and privilege and start thinking about empowering those without either. The lesson from ancient democracies and republics? It is better to arm the people than attempt to disarm elites—who are, after all, people too. It may be better to concede elections to elites and commission ordinary people to exercise their judgment and defend their interests. But what do I know?